The Wizards’ John Wall shooting against the Suns on Friday. Washington, playing at home, defeated Phoenix, 109-106. 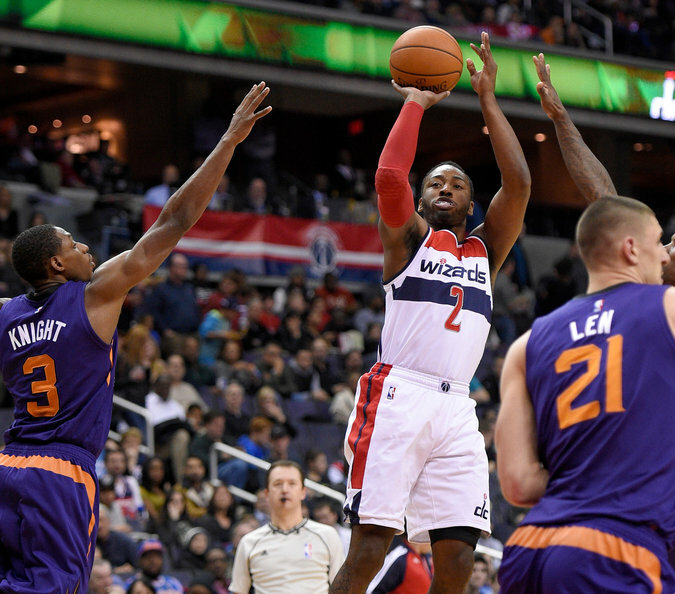 Bradley Beal scored 34 points, Ramon Sessions added 18 and the Washington Wizards rallied to beat the visiting Phoenix Suns, 109-106, on Friday night in a turnover-filled game. Washington improved to 8-9 after losing five of its previous six games. Eric Bledsoe scored 22 points, and Brandon Knight had 19 for the Suns, who are 1-3 on a six-game trip. The teams combined for 46 turnovers. The Wizards took a 104-103 lead on Otto Porter’s 3-point play with 1 minute 42 seconds to play. Beal hit a floater with 47.9 seconds to play for a 106-103 lead. Bledsoe made a layup with 15.9 left, and Beal added two free throws with 11.6 left for a 108-105 advantage.